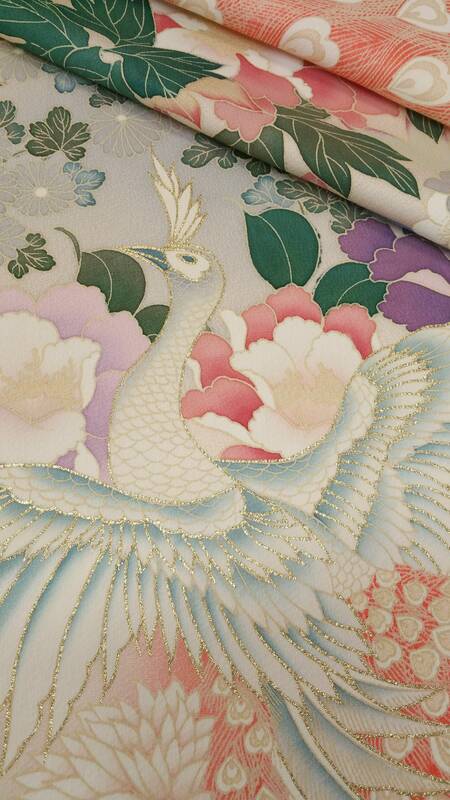 This beautiful silk fabric was part of an unfinished furisode kimono. The furisode kimono is traditionally worn by young, unmarried women and is one of the most beautiful and decorated kimono. This silk was basted together into the kimono form but was not finished. Because of this the fabric has tiny pinholes and creases. There are also pencil marks on the selvages. These marks were made by the seamstress to mark how the kimono was to be sewn together. This silk would make an amazing scarf, wrap, hair accessory, pillow case or skirt. It can be used for apparel but please remember that kimono fabric is not as wide as other fabrics. This panel was the sleeve of the kimono. The entire panel is about 100 inches ( 254 cm) long x 14.75 inches ( 37.5 cm) wide. 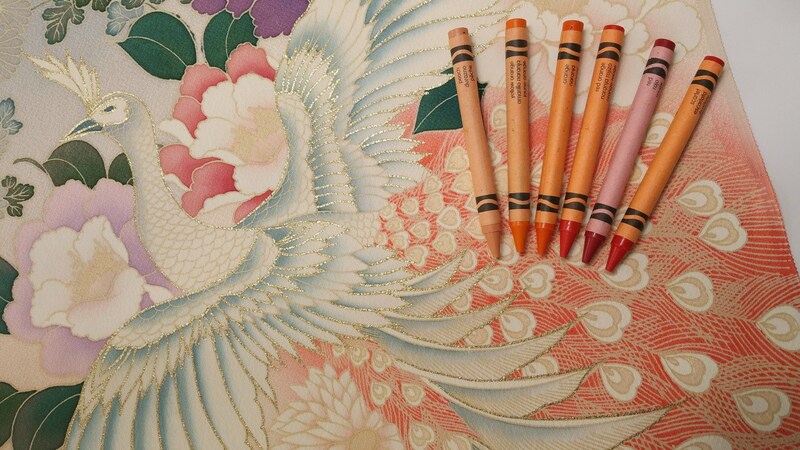 This panel has no cuts in it (as many panels from finished kimono often do). Please note that the designs do not face all the same direction. All designs are printed so that they are facing the correct direction when the silk is held by the center of the panel. 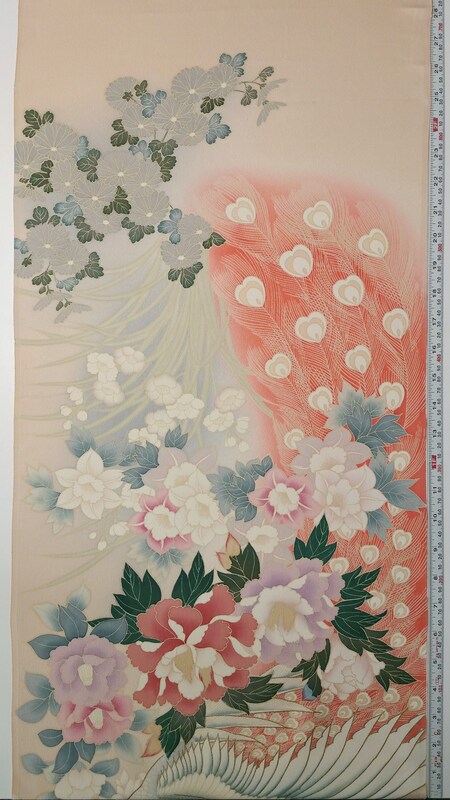 This beautiful silk panel has printed and dyed floral patterns featuring branches of plum blossoms (ume), hydrangea, chrysanthemum, iris and peony over a dyed peach background. The peach background has a pink hue. Portions of the background are also dyed an orange or silver hue. The panel also features a printed, peacock birds. The flowers are in colors of gray-silver, lavender, pink, white, blue and green. The entire panel is seen in photos 2 through 4. The panel was too long to fit into one photo. Photo 2 shows the first end of the panel. This end of the panel features iris, mums and other flowers. I do not seen any flaws on this section of the panel. There are a couple paint and pencil marks on the selvage line. These marks were made by the seamstress and do not extend past the selvage edge more than .25 inches (.64cm) and should not affect how the fabric can be used. Photo 3 shows the second portion of the panel. 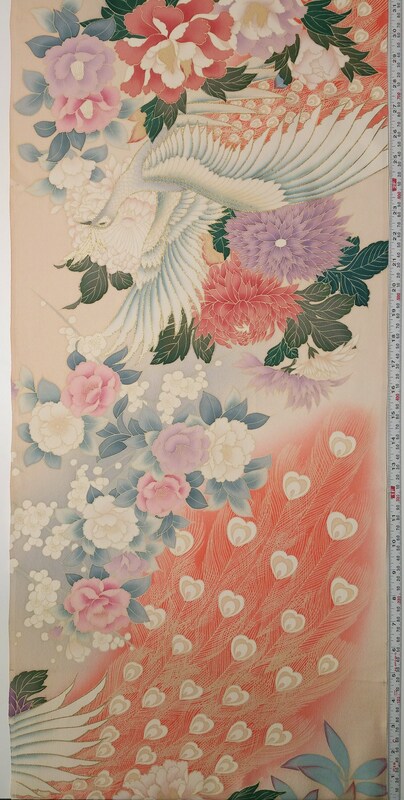 The body of a peacock, mums, peony and hydrangeas can be seen on this portion of the panel. The peacock has metallic gold accents. Once again, There are a few marks made on the selvage line. There are also a few areas where the dye bled a little outside of the pattern. This can be seen in the top photo in picture 6. There is also a small dye spot that can be seen in the bottom photo of picture 6. I do not see any stains on this section of fabric. Photo 4 shows the third end of the panel. 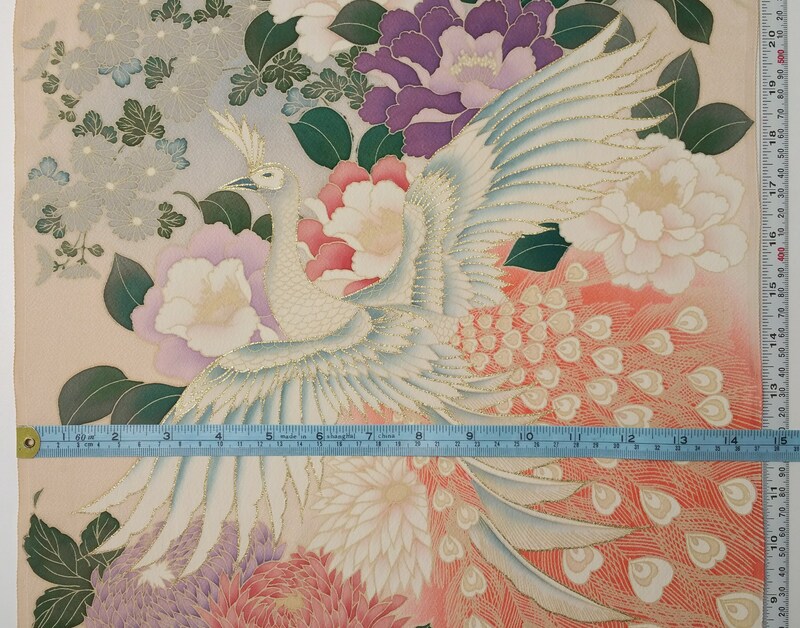 The body of a second peacock, tail feathers, ume (plum blossoms), peony and mums can be seen on this portion of the panel. The peacock has metallic gold accents. 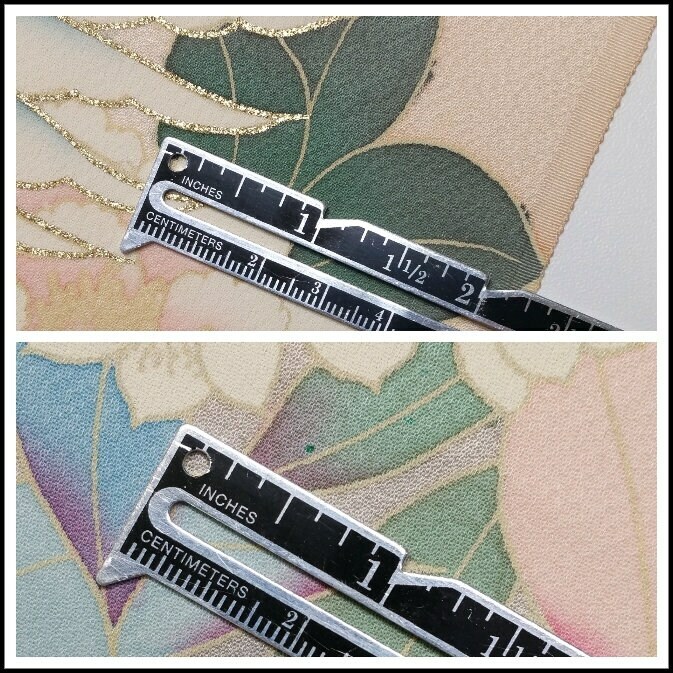 There are more pencil marks and paint marks (made by seamstress) on the selvage (top left picture of photo 7) and a small spot where the pink dye transferred onto the peach-pink background. This can be seen in the top right photo of picture 7. Photo 5 shows the last end of the panel. Flowers and the peacock's tail feathers are seen on this portion of the panel. There is one small soil spot on this portion of the panel. 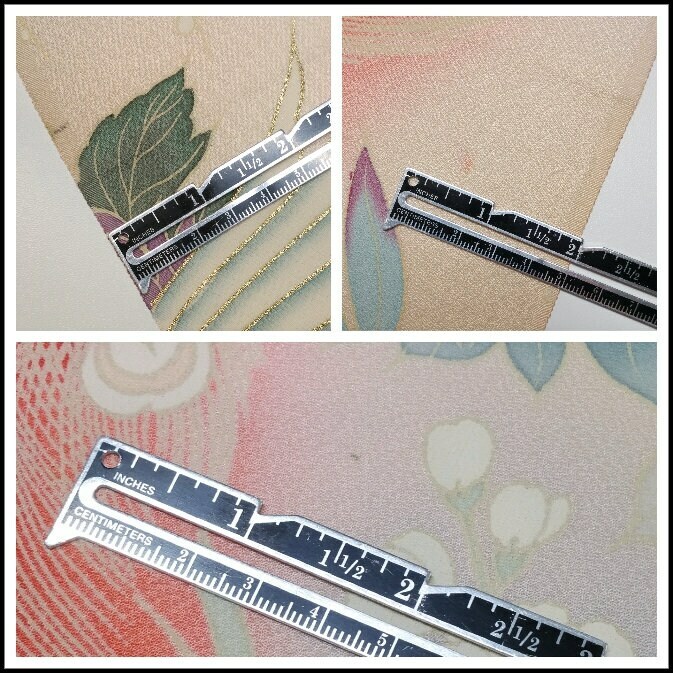 This spot can be seen in the bottom photo of picture 7. This spot is adjacent to the peacock's tail and is about 6 inches (15.24 cm) from the selvage edge. The silk is a medium weight, kinsha silk. This silk is considered a "crepe type" silk but it is much smoother and more fluid than chirimen silk. It has a smooth, slightly slippery, texture and wonderful sheen. Please enlarge the photos to see the beautiful color and texture. The last two photos show the colors most accurately. 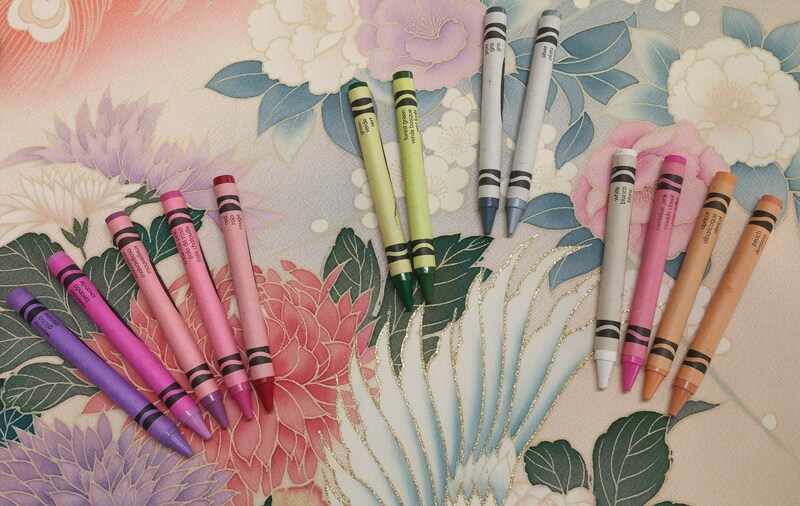 Crayola brand crayons were place in the photos for color comparison. 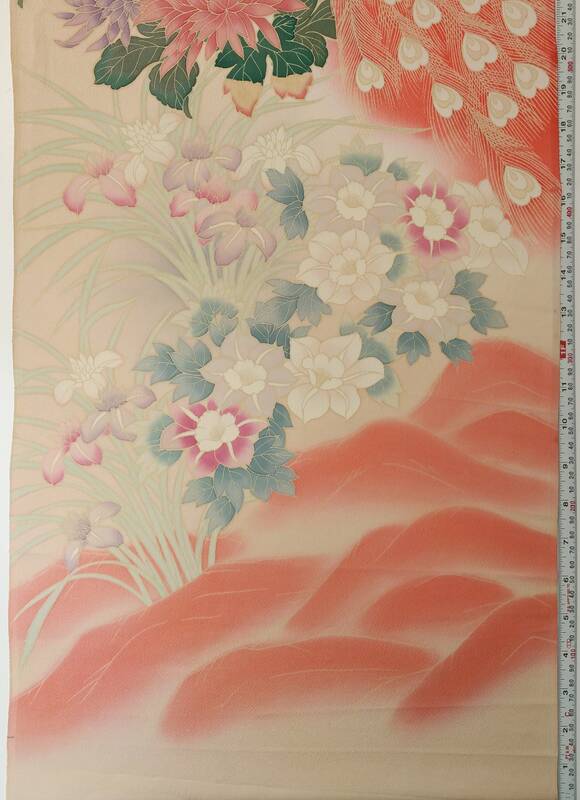 The background color of this silk is a peach color that has a pink undertone. It appears more or less pink depending on the light source.